Next month, Jacomo will launch a male counterpart to 2005's Jacomo for Her. 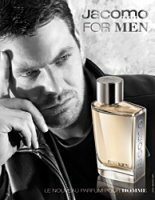 The Jacomo for Men fragrance is geared towards 30 year old men, and is described as a "woody oriental constructed around the vetiver note". It was developed by perfumer Mathilde Bijaoui, and the notes include pineapple, citron, plum, pimento, nutmeg, black pepper, coffee, tonka bean, amber, vetiver and cedar. 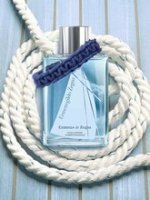 Ermenegildo Zegna has released the 2007 version of Essenza Di Zegna Acqua d'Estate, the summer limited edition fragrance with peppermint, grapefruit, bergamot, clary sage, cardamom, myrtle, vetiver, amber and musk. This year's bottle takes a yachting theme (you can see the 2006 version here). Other recent releases from Ermenegildo Zegna: ZegnaIntenso.